Section 504 of the Rehabilitation Act of 1973 is major federal legislation that impacts entities that receive federal funding. It is civil rights legislation for persons with disabilities designed to prevent any form of discrimination based on disabilities. 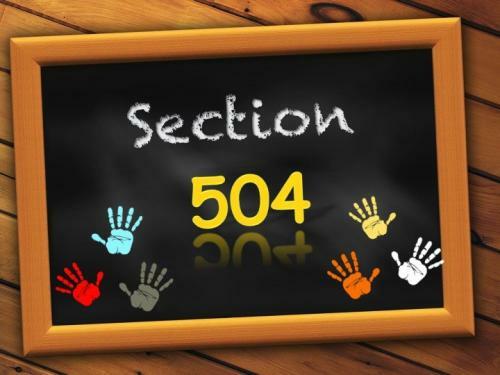 Included in the U.S. Department of Education regulations for Section 504 is the requirement that disabled students be provided with a free appropriate public education (FAPE). These regulations require identification, evaluation, provision of appropriate services, and procedural safeguards in every public school. The definition of disability under Section 504 is defined as those having any physical or mental impairment that substantially limits one or more major life activities (including learning). A child may have a disability; however, may not qualify for either 504 or Special Education because the condition does not significantly impact their educational progress. If a district has reason to believe that, because of a disability as defined under Section 504, a student needs either special accommodations/modifications or related services in the regular classroom setting to participate in the school program, the district must assess the student. If the student is determined to be disabled under Section 504, the district must develop and implement a plan for the delivery of all needed services. If you suspect your child may have a disability condition that would require a 504 evaluation for eligibility, contact the counselor at your school to request a School Building Level Committee (SBLC) meeting.